Vera Wang is the queen of all things bridal in this country. Aspirational brides can shop for her gowns, China, stationery, lounge wear and everything else possibly related to their nuptials. This is why Vera Wang fans were surprised with an avant-garde sportswear that paraded down the runway. Celebrities are often in beaded Vera Wang gowns on the red carpet in rich colors while romantic brides are draped in yards of luxury fabric. On this catwalk, the designer went minimalist. Fabrics in ivory and black, crisp or translucent or draped. Sleeves were super long. The look was more up-and-coming renegade designer at MILL Studios rather than the Godmother of weddings. Wang clearly wants a break from her look to explore a fresh start as a designer. I wonder how much of that encompasses other aspects of her life as well. The show did include a few embellished, evening-appropriate pieces. 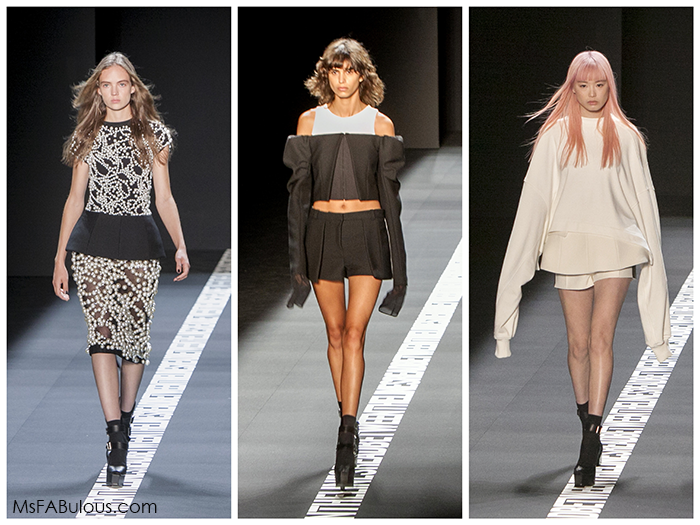 The silhouettes were still pared down and minimalist with the black and white palette. However, there was a running Pearl embroidery pattern that included varied pearl sizes in an organic design. I think it is healthy for all creatives to refresh and reset their work. Surely not all designers look as good as this show did. I wonder if Vera Wang's fans agree. Then again, how often do you need to get married?